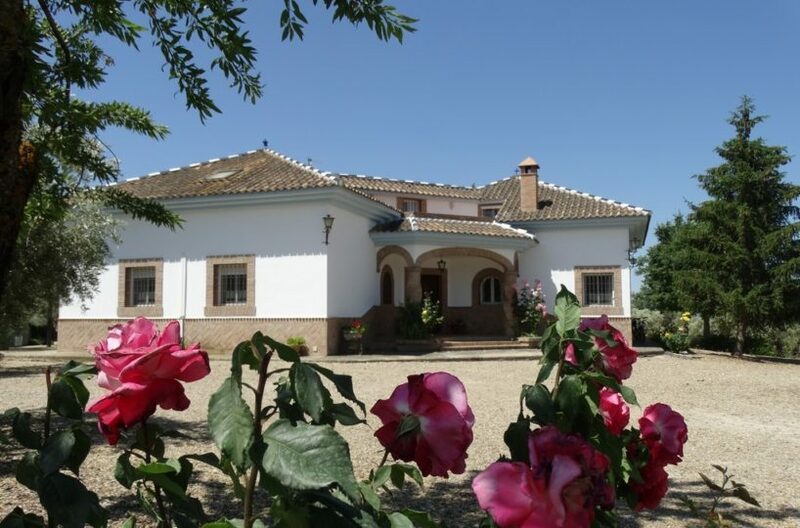 A luxurious villa located in the andalucian countryside between Vejer de la Frontera and Medina Sidonia. Originally 3 individual farm houses, Villa Algar has been lovingly restored to create one spacious property. The house consists of two barns connected by a rebuilt stone ruin which today forms the salon. Barn number one has a very large fully equipped kitchen, dining room and lounge area with a large open fire place (with safety heat-proof glass doors which can be closed), and a double bedroom with it’s own en-suite. The large salon with its floor to ceiling glass doors gives you a fantastic view onto the pool and garden. The glass doors can be opened for a lovely indoor-outdoor feel. The second barn has a very decadent 35 sq/m master bathroom with bath and shower. Next door is the second double bedroom, and then the master-bedroom with its own en-suite bathroom (bath and shower) and French doors opening up to the west side of the garden. The garden has a patio area for al fresco dining and a private swimming pool (3m x 7.5m). The roof terrace offers stunning views of the surrounding countryside and on a clear day all the way to Africa. The house is completely self sufficient with its own water well and alternative energy system. There is underfloor heating throughout for the winter months and onsite parking for upto 6 cars.